Today, officials from the Miami-Dade Aviation Department (MDAD) and U.S. Customs and Border Protection (CBP) hosted a ribbon-cutting ceremony to celebrate Miami International Airport’s newly renovated Concourse E federal inspection facility for international arrivals. The facility is the first in the country completely dedicated to providing expedited passport screening via facial recognition. The new technology verifies a travelers’ identity by matching a traveler to the document they are presenting. Since launching the facial recognition pilot program in November, the Concourse E facility has been screening as many as 10 passengers per minute. 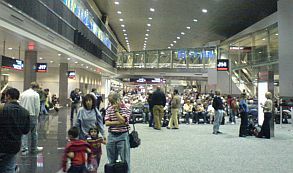 In addition to providing the latest in expedited passport screening technology, the new facility reduces the walking distance for Concourse E and F passengers who previously only had access to the Concourse D passport hall – decongesting one of the country’s busiest arrivals facilities in the process as well. The Concourse E facility follows another industry-leading innovation launched by MIA in 2017. Last August, MIA launched an update to the MIA Airport Official app that allows users to seamlessly access Mobile Passport Control and CBP Forms without ever leaving the app, the first airport in the world authorized by CBP to do so. The re-designed, all-technology driven facility also offers passport clearance via Global Entry kiosks and the Mobile Passport Control (MPC) app for select flights arriving at concourses E and F.